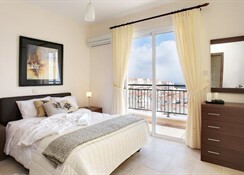 Soak in the atmosphere of northern Paphos at Club Coral View Resort, the ideal place to get away from it all. Its location is perfect for visitors looking for a quieter and more laid-back holiday. It can be reached from Paphos International Airport in about 30-minutes, which also makes the city centre with all its attractions and highlights easily accessible if you want to check out the museums, water parks and historic sites. A stay at Club Coral View Resort provides guests with a luxury experience. 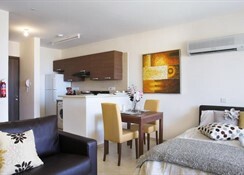 Rooms are beautifully designed, clean, comfortable and spacious. They come with a fully-equipped kitchenette for guests to dine in with and there are two supermarkets situated within walking distance, so you can stock up on for a night in. Though it’s in a quieter location, there are still plenty of great things to see and do. Take a hike around the exciting Avkas Gorge, see a slice of the local history at the Mycenaean Settlement of Cyprus Museum or hop in the car for a short journey down to the coast. 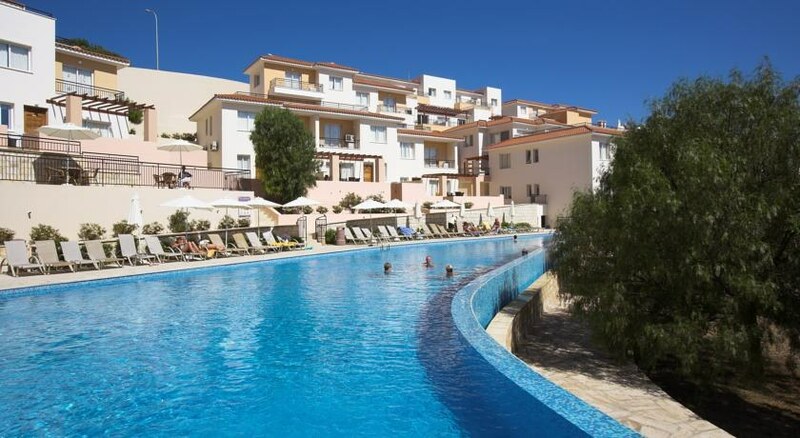 Club Coral View Resort is located 30km from Paphos International Airport, nestled away in northern Paphos. The beautiful Coral Bay Beach is just a 5-minute drive away. Central Paphos lies about 20km away which translates into a short drive and is where you will find Paphos Waterpark, various historical sites and numerous bars and restaurants, in addition to conveniences such as food and retail shopping and ATMs. Paphos Zoo is 7km away and the verdant greenery of Pikni Forest is just 3km. There are many great restaurants and bars within either a short drive and several that can be easily walked to from the resort. 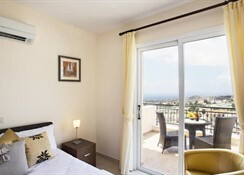 Rooms at Club Coral View Resort beautifully kept with neutral tones that maximise the Cypriot sunlight that comes pouring through creating a light and airy atmosphere. All rooms have standard facilities such as air-conditioning, balcony, tea and coffee makers, T.V., safe deposit box, wi-fi and more. There are several room types. The Two-Bedroom Apartment and Deluxe Two-Bedroom Town House are ideal for a larger group staying together as they sleep up to six guests. 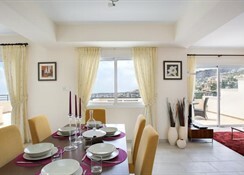 One-Bedroom Apartment sleeps up to four guests and Studios sleep a maximum of two guests. 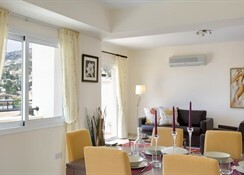 All rooms come with a fully-equipped kitchenette and spacious living area as well either a terrace or balcony. As this is a self-catering establishment there are no restaurants or bars on-site, however, you will be able to easily find plenty of great options around the resort that are easily accessible. For instance, Savvas Grill has an incredible 101 international and local dishes on offer, providing a good all-round menu to suit a variety of tastes. Green Hill Café and lounge bar is a great spot to stop for lunch or a mid-afternoon coffee break. Head towards the coast and Sea Caves provides a great selection of delicious dishes and allows you dine-in whilst looking out over the sea. Guests at Club Coral View Resort can enjoy the outdoor swimming pool, which is operational during the summer months. 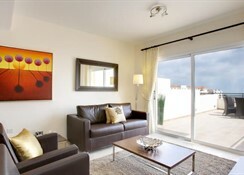 There is also a sun terrace with sun loungers available for lazing on and soaking in the Cypriot sunshine. The laid-back atmosphere of Club Coral View Resort can also be enjoyed in the resort’s lush gardens. Attractions nearby include Paphos Zoo, the Sea Caves, and the inspiring Avkas Gorge. Central Paphos is just a 15-minute drive away, where you can enjoy museums, waterparks and historical sites. This was our 3rd year here. I’ve said it on other reviews, if you want a lively luxury holiday then stay away. If, like us, you want peace and quiet, are happy to clean up after yourself, it’s perfect. You need a car. It’s up in the hills and there isn’t a lot around. A supermarket and a few bars/restaurants about a 10 min walk. The resort itself has nothing except your apartment (well equipped including washing machine) and a pool. That is is!! No maid service, no bar or poolside bar, no on site shop. It’s clean, well equipped and we love it there. For us it’s perfect. Do your research first. Hire a car, explore the beautiful island, come back to the apartment and literally chill in peace and quiet. Perfect. Clean self catering accommodation. All you could need for a holiday. A bit of the way if you don't drive but this means it is a quiet area that you can get to by taxi or bus.